The easiest, most versatile, fool proof, and delicious paleo cassava flour tortillas! Mix up and cook in 5 minutes! Make them thick, thin, crisp, or soft! Gluten free and dang delicious! You really can’t mess up these tortillas. If you happen to add too much flour to the tortillas or they seem a little dry, just add more water or coconut milk. If the batter is too wet for your liking, just add some more cassava flour too it. Wanting a thin tortilla? Roll out the dough with a rolling pin between two pieces of parchment paper and you will have beautiful thin tortillas that holds together GREAT! Also, if you want a thicker (almost pita, which I LOVE) keep the dough a bit thicker. Any way you make these you can’t go wrong! These tortillas are fool proof and so dang easy to make! I have been making these tortillas all week (literally ALL WEEK)! You’ve probably seen my Insta stories cluttered with these cassava flour tortillas with a side or eggs, guac, or salsa. One of my favorite things about this recipe is the ability to store them in the fridge for multiple days! I either make the batter and cook one or two when I’m ready to eat. Or I cook them all ahead of time and store them in an air tight container in the fridge. Either way is safe and super easy! To store the batter in the fridge- make the batter and cover with an air tight lid or plastic wrap. Dreams do come true. Now you can have all your breakfast feast dreams without the hassle! And know that it’s going to be be good for you. One of the most asked questions I get what are my favorite easy breakfast ideas that can be made ahead of time. I know we’re all super busy in the mornings! Having a delicious tortilla that can be filled with eggs, avo, or made into a breakfast wrap is heaven! I’m not kidding when I say that these tortillas are versatile. They can be made crispy with a little crunch when you bite into them- perfect for hardshell tacos. Or you can make them soft, which makes snacking and paleo wraps bomb! Um, also you can make them in between. 😉 Whateva you want! I wasn’t sure how these tortillas were going to turn out with just cassava flour. But turns out, they work perfectly! Like almost too good and easy. Never mind, that’s not a thing. Cassava flour is the perfect star for this recipe. As I was making a double batch of these tortillas again today it took me back to my trip to Belize. Pounding out tortillas in a bright turquoise colored outdoor kitchen with the thick hot air, palms, and a beautiful souled Mama by my side in the kitchen. Happy days! So homies. Go make tortillas. Make em good. 2 cups cassava flour be sure to use Anthony's Goods brand! This recipe will not work with tapioca flour! Combine ingredients for the tortillas in a medium size bowl and mix together until well combined. The dough should stick together and be a smooth consistency. Divide the dough into 10 equal parts and shape into balls. On a piece of parchment paper roll and pat each section of dough into a thin tortilla. You can use your hands or a rolling pin for this. If the dough is sticking sprinkle lightly with cassava flour. Heat a fry pan on the stove over medium/low heat. Drizzle the pan lightly with olive oil for cooking. Cook the tortillas for about 1-3 minutes in each side until it reaches desired consistency. You can make them crisp or soft. It's up to your personal preference! Do you use the canned coconut milk or the refrigerated kind in the carton? Thank you! Hi! This looks great! Is there a reason you use coconut milk? Could I use regular milk instead? Hi Sarah! Yes, I use coconut because I am paleo 🙂 You can use regular milk instead if you aren’t dairy free. Hi there, this is an awesome recipe. How long do you think the dough can stay in the fridge after you make it? I am kinda thinking like making fresh tortillas each day off the dough ball kinda plan. Thanks for your insight. I usually cook them, but freezing them uncooked sounds great too! Can I sub any other flours for casava flour? Like tapioca flour or almond flour, etc?! These sound amazing, but I’m allergic to coconut. Do you think almond milk would work? Maybe add some lard to make up for the lost fat content? Lard would make them tadte more like the real thing. How dod they turn out? Please help. I think there is something wrong with the recipe because when I made it, I combined everything and it was the consistency of soup. Hi Katie, can you tell me, did you double check you were using the right kind of flour? I had the same issue with the dough being entirely too wet to shape into balls. Had to add at least another 1/4 cup of cassava flour. Also can’t for the life of me figure out how you transfer the tortilla from the parchment paper to the pan. Hoping I figure out a system after a few tries because they are delicious! OMGSH these are delicious!!! This is probably the 5th Tortilla recipe that I’ve tried and the only one that was edible!! AND they’re really amazing!!! So good to hear! Thank you so much for the kind words! These look amazing, can not wait to try! Do you use canned coconut milk or a boxed/bottle one from the grocery store? Thank You for all of the yummy recipes! You can really use either- I use a lighter coconut milk from the box. How long do these keep in the fridge? Would it be better to freeze them if it’s for a few weeks? Hi Suzanne, they keep well in the freezer. Odd. I waited to add the water because I noticed others ended up with dough that was too runny. Well, mine is already too runny to be dough, more like pancake batter, and I haven’t added the water, yet. 2 cups of flour to 2 cups total liquid (1 c. milk, 1/2 each olive oil and water) is correct? Granted, I am using tapioca flour, not cassava flour, but I have been under the impression they are the same. I appreciate any thoughts or corrections to what I’m doing. Thanks! Julie, you cannot use cassava flour- it will not turn out. Cassava flour is VERY different from tapioca! Thanks for sharing, I will make a note in the recipe, so that others do not try using tapioca either. 🙂 Hope that helps! I’m confused…I see the recipe calls for cassava flour and yet in this comment you say not to use it. Is that a mis-type? Later you say tapioca. I think that maybe clarifies that this is not what you intended to say. Hi Sara, it says to use cassava flour- not tapioca. I said that because many people confuse the two. 🙂 Hope that helps! I was referring to what is a typo…comment #30 says “you CANNOT USE CASSAVA flour-it will not turn out…” The next line however says not to use tapioca, so it gets cleared up, but it still threw me for a loop initially. AND…for the ladies who commented that they had more like a pancake batter. It happened to me as well but I didn’t have quite enough cassava. Should have held off and not added all the water to begin with. I just spooned it into my hot pan and shaped them at that point. They were still good! Oh my goodness! These turned out PERFECT! What a great recipe! Hi Eloyse, you could try a mix of almond and arrowroot flour… not sure how well it will work, because it’s not the same as cassava. You could also try subbing with a gluten free flour blend. Great recipe, I added some cinnamon and honey after warm, which brought out some great flavors. I will add that even though the dough had the consistency of pancake batter, I poured them into the pan like I was making pancakes, and still even though they were impossible to flip without breaking apart, they came out like a denser version of naan with lots of the olive oil and garlic taste, and it still was edible and very good. I just tore it apart and ate it and it was like eating the bread with oil at a restaurant. Yum! I’d just love to figure out how to make them actual tortillas. Hi Lindsey, I used a different flour brand for this recipe (Anthony’s Goods) so that is probably why the consistency varied… I have noticed that Jeb’s flour is a bit more smooth and “liquidy”, Anthony’s tends to be more dry and coarse. Hi Joanna, I think a tortilla press would be a bit difficult and would probably opt not to use one. I used my Victoria Tortilla Press and it worked wonderfully. I did not see the “do not use tapioca flour” instruction and I made it with part tapioca flour. It rendered a batter similar to pancake batter that could nit be rolled up. I still cooked it like cooking pancakes and it work perfectly. The batter was very versatile. Loved it. Hello! I have an intolerance to coconut, so I can not use that milk. I want to try it with almond milk but I am not sure which one to buy because the normal one has too much sugar and the one that says “no sugar” has a very strong taste. What do you recommend doing? Have you ever tried this recipe with almond milk? Oh my goodness. These are incredible. Thank you for this recipe. My first ever tortillas that work. I used just the solid part of the canned coconut milk. I wonder how they would turn out using hemp milk or coconut milk in a carton that gets refrigerated. Would they be as amazing? Hi Christine, I have used all kinds of different milks so those should be just great! Hi Vee, what brand cassava flour did you use? That can make a big difference. Has anyone used almond flour instead? I don’t have cassava flour at the moment. So I tried this and i didnt even put in the water and had to add more cassava flour. then it would break up when i tried to tip it into the pan from the baking paper, so i would flatten it in my hand and put it in but it was too thick. how do you get it flatter and have it still binding? Hi Kate, what brand cassava flour did you use? Hi Beth I am wondering if your tried using your broiler and what the outcome was for you doing so? Thanks so much! I apologize if someone already asked this, but I cannot locate garlic granules or granulated garlic. Loved the recipe. I used my tortilla press and it worked perfectly using wax paper top and bottom. I have just made these tonight to go with a Paleo chicken Rogan Josh & coconut cauliflower rice. They were fantastic! I added some fresh rosemary from our garden too. The kids gave them a big thumbs up – they are the best ones I’ve ever made, according to them! I did find that it was a bit too wet to be able to roll out at first, so I just added more cassava (1 cup extra in total). They are so good! Hi There, can I use chickpea flour instead of the Cassava? Is there something wrong with this recipe? I had read the comments about this dough being too wet so I did not add any water but then, I added the oil and they were way too oily. I will make them again but cut the oil in half. They also got too crispy to fold around any fillings. Will try again because I have more cassava flour but, this recipe as is, did not work for me. I know there are a ton of questions about coconut milk already on here- so I figured why not a couple more! Haha! Hi Brittany! So, I buy the canned coconut milk from Thai Kitchen and for almond milk I either make my own or I buy unsweetened organic. 🙂 Hope that helps! I am so so excited! these turned out amazing. I am not sure how I just now found your page but Im so happy because its true to paleo. Thats hard to find these days, a true blogger/foodie who is true to what they say. alot of people claim to be paleo but add cheese or other non paleo things because “they workout” or because “their bodies tolerate it”. Bottom line did I mention I am happy I found you? Missing flour naan and tortillas, I went to the African grocery store to get cassava flour to make these tortillas. First, since I’m only cooking for one, I made 1/2 of the recipe. Too runny. I added more flour until I could get the doughy consistency that I thought I should have. I rolled them out, still needing to add more flour. They didn’t look all that great going onto the hot griddle, but they turned out amazing and delicious. I had to use almond milk and no matter what I couldn’t get these to stay together after rolling out. Is that really a result of not using coconut milk? Frustrating! Hi Marie, what brand cassava flour did you use? Be sure to use Anthony’s Goods brand for perfect results! Did not work 🙁 Very soupy. If you don’t have the same brand as flour as is on the recipe, do not make. I used the Cassava flour and full fat coconut cream. They ended up very oily and I didn’t add any additional oil to it. Are other’s coming out oily? 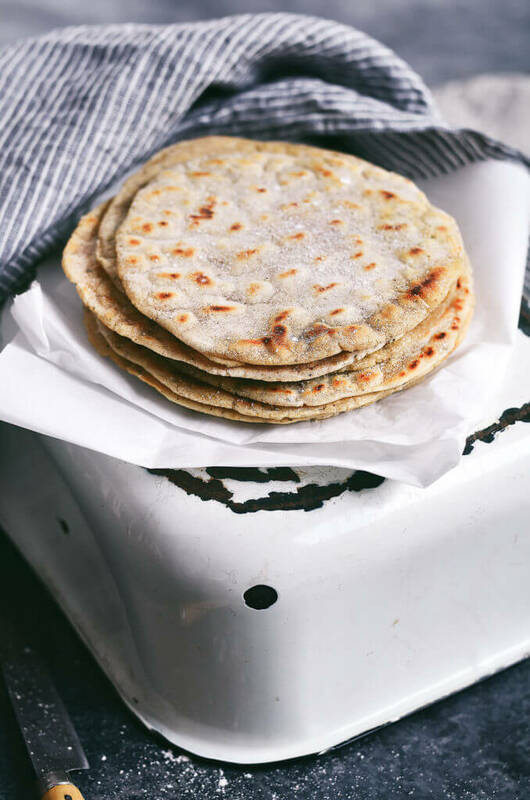 I have been wanting to try a paleo version of tortillas for a long time. After a hard day at work and puzzle solving on the couch for a few hours, I forced myself off the couch to try a half batch of the cassava flour tortillas. I have had cassava flour, and several other flours in my pantry for months, along with the a cold, solid can of coconut milk. I eyeballed the recipe and rolled out the dough a few balls at a time between parchment paper. made about 6 6 inch tortillas. I had a soft shell with some taco filling and salsa – perfection. I plan to use these for tuna salad tomorrow for lunch. I can’t wait to share these with my mom. I like to cook for her when I visit on the weekends and show her new, healthy recipes. Thanks! These were super easy & SO good!! This was awesome. I began snacking while the other tortillas were being cooked. Addictive. My only thing is standing over stove to watch these but next I’ll make a whole batch of them. So yumm! Can you use coconut flour in place of cassava flour? Hi Cindy, cassava flour cannot be replaced in this recipe, sorry. Also, be sure you use Anthony’s brand for best results! Mine are the saltiness thing I have ever tasted! So oily too! The texture is good though and they’re easy, so I will make some adjustments. Looking forward to giving this a go as I’ve finally got my hands on cassava flour! I have Otto’s brand and wondering if anyone has had any success with that brand? People have tried Otto’s but the batter ends up runny. I tried this recipe a few times and discovered that it is best to omit the 1/2 cup of water. I have no idea why it is in there. Balls shape beautifully when you don’t add the water! I use Ottos and had no problems. Thank you for the awesome recipe! Made these today. Used Ottos. They turned out great. I made them thin, thick, soft and hard. I flattened them between two pieces of parchment paper with my hands and cooked them in a iron skillet. YUM!! I ate to many though. Haha! Thank you. I made these and I too came out with I wet pancake like batter. I had to add another 3 cups of flour to get them to form into balls and it was still a little on the wet side. I used this flour https://www.amazon.com/gp/aw/d/B077L3KNQ4/ref=sxts_1_a_it?ie=UTF8&qid=1518185384&sr=1 And I followed the recipe exactly as stated. They were delicious though! Hi Liz, that should work- it will probably change the flavor. I just made this and they are really easy to make and taste very good. Easiest way to make them, you put the ball of dough between 2 pieces of parchment paper, put a cutting board or anything flat on top and with both hands you put pressure down to make them as thin or thick as you want. They will be perfectly round. To transfer remove the top parchment paper and transfer the tortilla from the bottom paper to the pan it will come out easily . Love these but have a couple of questions. When I rolled mine they cracked on the edges. Thinking this might be because they were too dry? Also, I cooked them on a cast iron skillet on very low heat and they seemed to burn in areas before getting fully cooked. It appeared if I cooked them too low (too long) they got dried out. Hi Tracy, I would try cooking them on a lower heat and not dusting them with as much flour to prevent burning. Hi! I made these for the first time today. I haven’t tried on yet since it’s Lent, but they smell delicious! I flattened mine with my hands, but they’re still pretty thick. Do you spread something on them to eat (tuna salad, etc.)? Will they crumble? Thanks! I couldn’t find cassava flour at my local grocery store, but I did buy Bob’s Red Mill gluten free paleo baking flour. Would that work as a substitution or should I just make your almond flour tortillas? Hi Corinna, you will need cassava flour for this recipe. 🙂 I would suggest making my almond flour tortillas. I was needing a “bread fix” as I am newly off of gluten for the third time in my life. I found your recipe and thought it looked amazing…. and holy crap! It’s amazing!! My 3 year old daughter is gobbling it up and that’s a huge deal! Thank you so much for posting this recipe, it has saved my taste buds. my batter was very wet, similar to pancake batter. i used TERRASOUL organic cassava flour. i just spread batter on the pan and made a crepe like thing for the tortillas. the flavor was awesome, but since they were thick they were kind of gummy. These were amazing. Even my boyfriend liked them…. and he always rolls his eyes at anything ‘healthified’! Total disaster for me. Dough was like pancake batter (I followed the recipe perfectly), I added A LOT more cassava flour thinking that would fix the problem. Couldn’t get them off the parchment into the pan as they ripped apart or stuck to the paper and wouldn’t release… more cassava flour – finally got one ripped one into the pan. They taste good, but nothing Fool Proof about these! I threw it all away – what a waste. I used TERRASOUL super foods Casava Flour. It sounds like the recipe doesn’t work unless you use the certain brand recommended. *Kaylie – maybe you can make that super clear in the recipe because it sounds like they work only if you use the right brand of casava flour. Sounds like not all casava flours are created equal. Hi Maji, sorry these didn’t work for you. I would use Anthony’s Goods cassava flour for best results! 🙂 I added a note about that in the ingredients list. Thanks! These are great, and so easy! I used Otto’s naturals cassava flour and had no problems. I find cassava tortilla recipes generally quite forgiving…I didn’t add the garlic, and fried them in an un-oiled cast-iron skillet. This recipe is my favourite so far! Thanks. Hi, can you make these without coconut milk? Thanks Kaylie, but what I meant was could you completely omit milk and simply use the olive oil? No, that wouldn’t work, sorry. You could use water instead. HOW do you get these to not fall apart? Hi Alissa, I’m sorry to hear they crumbled on you. I have made this recipe time and time again and they have never crumbled on me! What kind of cassava flour did you use? Some people have reported that using different brands of cassava flour produces varied results. Do you suppose substituting ghee for the olive oil would work, and almond milk for the coconut milk? I have food sensitivities to these and am hoping to find a recipe that will work for me. First of all, these are soooo much better than the cauliflower tortillas I usually make (easier and tastier) and that is coming from someone who only has one successful tortilla, thus far. The suggested flour was not to be found so I went with another brand. The texture was fine. All good there. What is currently making me nuts is that I can’t seem to get the tortilla from the parchment to the darn pan without falling apart. I have made 4 so far and only 1 came out well. I am taking a break and having a glass of wine. 🙂 Before pouring, I wrapped each “ball” in plastic wrap and put in the fridge. I am hoping (like other dough) I will be more successful if I chill them and try not to handle them too much (with my hot little hands). I also put an ice pack on my granite counter hoping that will help. I tried your trick (holding the parchment over the pan) No luck. All that happen is the flour I used to help not stick went everywhere. (Hence the wine). FInger’s crossed my “chilling trick” works. Hi, thank you for the recipe. Question: have you tried any different kind of oil? Like coconut or avocado? Hi Naomi, yes I have tried with avocado oil and it works and tastes great! Um, thank you. These are AMAZING. I did have to add almost an additional cup of cassava flour (I’m using the Terrasoul brand) to make them into a proper dough, but it’s possible that was just because I over-measured on oil/coconut milk… will try it again (and again!). I think this would make an excellent substitute for naan and maybe even pizza dough. I’m on the AIP diet and I took a couple of these and guac to a baseball game yesterday, and was perfectly happy 🙂 THANK YOU! YOUR RECIPES ARE AWESOME! Hi there I used Fufu flour – half cassava and half plantain and they are amazing! I didn’t use garlic or pepper as they are for my 7 year old on AIP but they taste great with just salt. I had no issues with the consistency – though my coconut milk was quite creamy. Like the idea re a pizza base – I’m thinking they could also be a great Turkish Pide, if I rolled some mince into them. I cooked them on a George Foreman flat griddle – I’m in Australia, so not sure if you have these in the States. Anyway, very happy with the recipe – they will be really versatile for our family. Is this 17 grams of carbohydrate per tortilla or per recipe? I made this for breakfast and they were so good. It was wonderful to eat bread again!!! I ate two immediately! I didn’t have garlic crystals so I used 1 scant tsp of garlic powder and scant 1/2 tsp. regular pepper. They seemed rather oily so I will reduce the olive oil next time. I had to add more cassava to make them easier to work with as dough was wet and sticky. Parchment paper worked perfectly for rolling and transferring to frying pan. I placed them in the pan with the parchment on top and then peeled it off. I cooked them all and will store in fridge for quick snacks. Thanks for a great recipe. Hi Chris, if you make the batter you can store it in the fridge for 2-3 days. Thanks Kaylie. Is therr any way to keep them longer? Freezer perhaps? I want to make a stash of tortillas and use them for a week or two. Hi Chris, freezing these is a great option! Omg!! I finally found the best recipe ever, the recipe is perfect. It was real easy to make (I don’t have energy to make complicated things). I’m on paleo due to health issues not by choice, so this is a great alternative to tortillas or flat breads. I’m planning on using this recipe to make dinner rolls. Thanks very much for sharing. My husband is a type 1 diabetic and recently has been diagnosed with celiacs so we are totally gluten free in our house—-these tortillas are delicious !!! I am so impressed with this recipe — my only concern is how to cook them. I prepared in a stainless all clad fryer and just wish they had not come out as oily. When I cut the oil back they stuck to my pan but hey—-we will have nachos!!!! I had a very hard time keeping these in tact before putting them on the pan. Does it make a big difference if I use Ottos Casava flour vs Anthonys cassava flour? Hi Ann, I have only tried with Anthony’s Goods, but others have reported that using Ottos has turned out different results. I ended up adding 1 1/2 cups of almond flour to the batch and it turned out fine. I’m excited to try them and see how they taste! Hi I did this and instead of dough I got pancake batter. I didn’t want to add more flour cuz I didn’t want to make too many so instead I made them like pancakes. Any advice for my next try? Hi Kimberly, what brand of cassava flour did you use? I have only tried this recipe with Anthony’s Goods (not sponsored, just what I had on hand) that may be the difference. I’m struggling to keep these intact, they just crumble after transferring them from the parchment paper to the the skillet.. how do you keep them from crumbling?. I’ve used Anthony’s vegan cassava and the regular Anthony’s cassava flour and they crumble don’t get It. Hi AJ, are you rolling them out in too much flour maybe, so they care becoming too dry and crumbly? 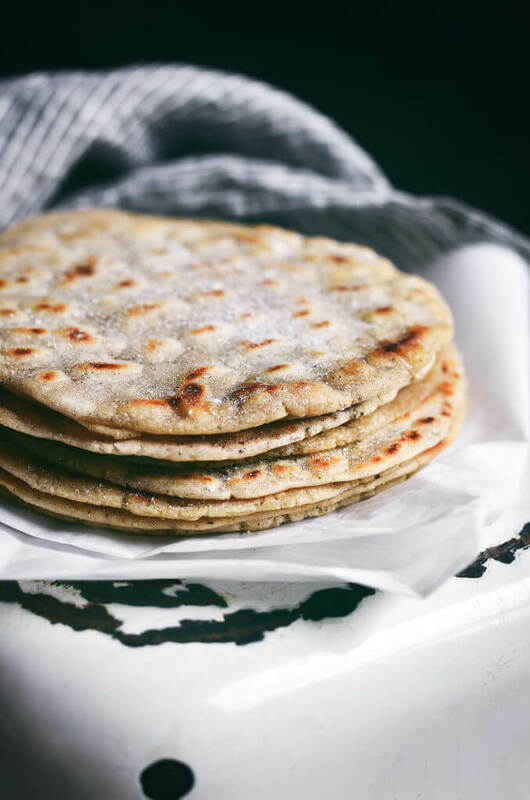 I have been dying for some grain-free tortillas that are not $2 apiece in the store and cannot wait to try these and your almond flour tortilla recipe. One comment: I think you might have typo in comment #30 when you told the commenter “not” to use cassava flour. I might be confused but thought you might want to check. I made these to recipe and had to add a whole extra cup of Anthony’s Cassava flour to make a dough and not batter. They were delicious and worth the effort. Hubby and my young boys loved them as taco shells. 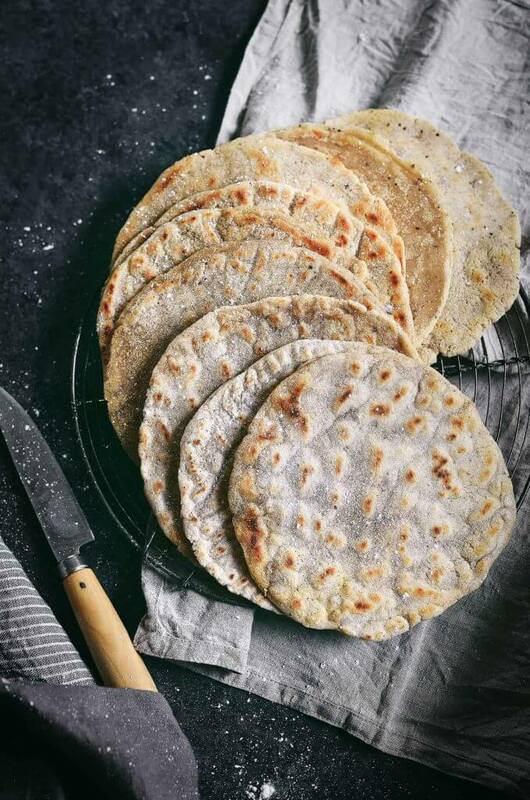 These tortillas look beautiful and I have such a craving for tortillas all the time! Can I use Arrowroot flour in the place of Cassava flour? Also, do you know of any other grain-free flours that would work just fine? Hi Heidi, sorry it has to be cassava flour for the recipe to turn out the same. 🙂 There aren’t really any good GF subs- just regular flour. I followed this recipe exactly and had to add almost 2 more cups of flour to get a dough to roll, flatten and cook. Are the measurements wrong? I Win, it was probably because of the brand of flour you used- I have have others reported having the same thing happen. Yes, that’s correct Leslie. You can add less water, if you brand of cassava flour is different or add more flour- it’s really easy to adjust to your needs. 🙂 Hope that helps. Just found your site a few days ago, and your recipes look incredible! Thank you, and I can’t wait to try some of your other creations! First, thank you for your response Kaylie. Shortly after my initial post, I made another batch using coconut milk and it made ALL the difference. The coconut milk is definitely key here. After making this second batch months ago, due to my schedule, I found less and less time for food prep and cooking in general so I had not made them again, but today I finally got my chance – I only had enough flour for half a batch – and they turned out great: perfectly pliable and so, so tasty! This is a keeper recipe for me. Thank you for sharing! I didn’t have coconut milk and didn’t want to use almond milk, so just used water for all the liquid. Subbed duck fat for 1/2 the olive oil. Needed a little extra flour to get off the parchment. YUMMY! I love them soft and flexible. So easy! Thank you so much for sharing this recipe. I just made it and loved it!! I am finishing up Whole30 and this is great addition to my foods. Now I can have a breakfast taco and still be grain free.. Thank you so much for coming up with a GREAT tortilla recipe! I’ve tried so many that were awful…. This one worked great! And tasted great- not over powering to where all I tasted was this tortilla… Thank you so much! And thank you for recommending a more reasonably priced cassava flour!! I think I may have said this on another comment for another recipe… But I hate that people say the only brand that you can even use is Ottos- soooo NOT TRUE!! Anthony’s works great and is so much more reasonably priced! I buy most of their products now! Hi! Any chance I bake this in the oven? Hi Jenny, I haven’t made these in the oven, but other readers have and reported it worked! Followed directions and the consistency came out like pancake batter? Added more flour and was so sticky.,used flour and still would not spread well. Any suggestions? Hi Gina, what brand cassava flour did you use? I had the same issue as many with runny dough. I didn’t want to waste all the ingredients so I experimented with adding 1/3c of coconut flour and they turned out great. I made these once and it turned out great. But the next time I used the same brand (Anthony’s) cassava flour and the consistency was too dry. I added more water and it still didn’t help and I could never get it to cook up correctly. I think a lot of the issue has to do with the consistency of how they process the cassava. I’m not sure how others are getting a dough consistency, because like many others, this came out more like a batter for me. Regardless of the brand of cassava flour, the ratio of flour to liquid consistency doesn’t seem right. Epic fail for me! This is a great easy awesome recipe! Thank you so much for posting this. The first time I tried it and they came out great. Great to hear Grace and thank you! Just made these and they’re fabulous! Not as pretty as your picture but they still look like tortillas! I’ve read all the comments about the mix being super runny. I will say that the first time around I FORGOT the water until I had mixed everything up. It had been about 10 min and then I added it to the mixture and it was soup. Threw it out, started over and this batch was perfection. I used Otto’s Cassava flour; 100% yuca root, gluten free, grain free, nut free and paleo. It was all we had in our stores but it worked perfectly. It’s Sunday and I won’t be using these until Thursday so I think I should freeze them? Thoughts please! 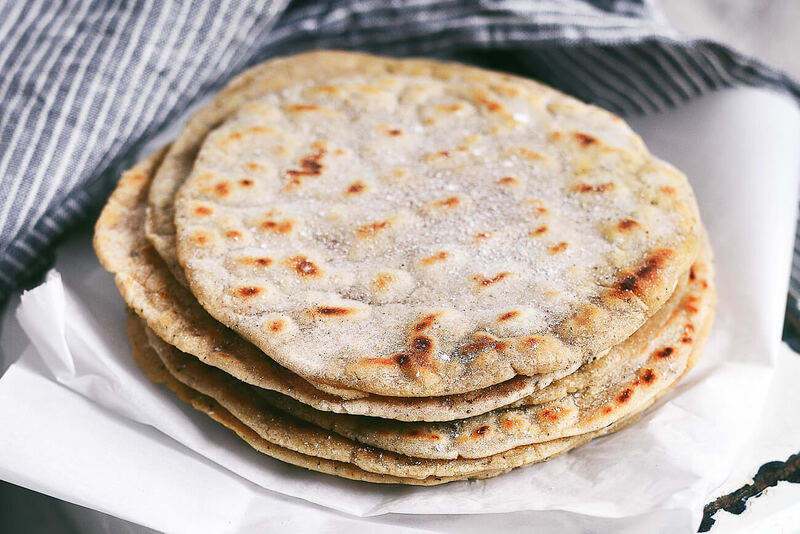 I made these Cassava tortillas for breakfast this morning—to make chorizo and egg breakfast tacos. 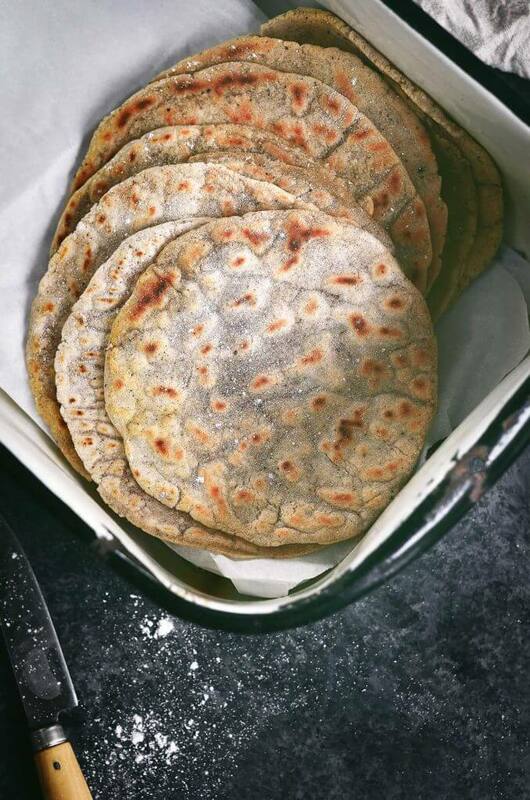 I’ve been making flour tortillas for 38 years now and these are just as delicious as my recipe. Over the years, I modified my mom’s recipe—swapped out Crisco shortening for coconut oil. But now I can swap out white flour for Cassava flour! Even though I totally forgot to add the water required in the recipe, they came out beautiful. I did have to add an extra bit of coconut milk to make it more pliable. That’s where maybe the water might’ve helped. It’s just me, but I wanted to add some baking powder to ensure their softness: 1 teaspoon was perfect! To all of you who have too runny, thin dough, it is the BRAND of cassava flour you are using. Only Ottos or Anthonys will work. I don’t know why it is. I bought another brand and had to keep adding and adding to get the dough to thicken up and then they weren’t good. It’s a mystery, but please try with the right brand. They will be right. Hi! I’ve tried several Paleo Tortillas recipes and yours is the best! Thank you! I pray your health continues to thrive, thank you for being proactive and share wonderful knowledge. Hi all, my batter was also really runny but I just scooped it straight into my pan and shaped it. Turned out a bit thicker which is what I prefer anyway. Think like Taco Bell chalupa type texture. Or naan. Or Indian taco. All delicious so I’m stoked. The question I have is, do you happen to know what the nutrition breakdown is, for macro counting purposes? Thanks for the awesome recipe! How do you reheat these after they have been refrigerated? I find they are breaking very easily once I remove from the fridge? Hi Paige, cassava flour really dries out, so it is important to reheat them either in a toaster or microwave before eating. Sometimes I will even run them under water before heating them up, because it helps to add moisture back into the tortilla. Delicious! Unfortunately, Anthony’s is out of stock everywhere this week, so I took a chance and used Bob’s Red Mill cassava flour, and it really didn’t work. The dough broke apart no matter what I did, one tortilla actually dissolved in the pan (I added a bit more oil to the pan thinking it would help as it does with so many other things), and overall, they are crunchy, rigid, and fragile. I’m looking forward to trying again with Anthony’s brand. Mine also came out like pancake batter. I’m using Anthony’s Goods organic cassava flour. I spooned it into my measuring cup so it wouldn’t be packed down. Ended up adding almost another cup. Wow this is great and thank you, can I also try these when Banting, are they still good? Any advice here ladies, my just fell apart in the pan. The dough formed well in the balls. Do you refrigerated it before you fry?